In this Feb. 23, 1965 file photo, Rubin "Hurricane" Carter, left, knocks out Italian boxer Fabio Bettini in the 10th and last round of their fight at the Falais Des Sports in Paris. Carter, who spent almost 20 years in jail after twice being convicted of a triple murder he denied committing, died at his home in Toronto, Sunday, April 20, 2014. Photo Credit: The Associated Press, File. 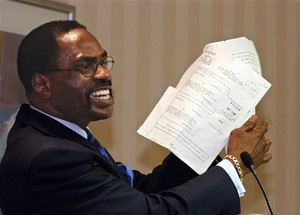 Rubin "Hurricane" Carter, the boxer whose wrongful murder conviction became an international symbol of racial injustice, died Sunday. He was 76. He had been stricken with prostate cancer in Toronto, the New Jersey native's adopted home. John Artis, a longtime friend and caregiver, told The Canadian Press that Carter died in his sleep. Carter spent 19 years in prison for three murders at a tavern in Paterson, New Jersey, in 1966. He was convicted alongside Artis in 1967 and again in a new trial in 1976. Carter was freed in November 1985 when his convictions were set aside after years of appeals and public advocacy. His ordeal and the alleged racial motivations behind it were publicized in Bob Dylan's 1975 song "Hurricane," several books and a 1999 film starring Denzel Washington, who received an Academy Award nomination for playing the boxer turned prisoner. Carter's murder convictions abruptly ended the boxing career of a former petty criminal who became an undersized middleweight contender largely on ferocity and punching power. Although never a world champion, Carter went 27-12-1 with 19 knockouts, memorably stopping two-division champ Emile Griffith in the first round in 1963. He also fought for a middleweight title in 1964, losing a unanimous decision to Joey Giardello. In June 1966, three white people were shot by two black men at the Lafayette Bar and Grill in Paterson. Carter and Artis were convicted by an all-white jury largely on the testimony of two thieves who later recanted their stories. Carter was granted a new trial and briefly freed in 1976, but sent back for nine more years after being convicted in a second trial. Thom Kidrin, who became friends with Carter after visiting him several times in prison, told The Associated Press the boxer "didn't have any bitterness or anger - he kind of got above it all. That was his great strength." "I wouldn't give up," Carter said in an interview on PBS in 2011. "No matter that they sentenced me to three life terms in prison. I wouldn't give up. Just because a jury of 12 misinformed people ... found me guilty did not make me guilty. And because I was not guilty, I refused to act like a guilty person." Dylan became aware of Carter's plight after reading the boxer's autobiography. He met Carter and co-wrote "Hurricane," which he performed on his Rolling Thunder Revue tour in 1975. The song concludes: "That's the story of the Hurricane/But it won't be over till they clear his name/And give him back the time he's done/Put him in a prison cell but one time he could-a been/The champion of the world." Muhammad Ali spoke out on Carter's behalf. Advertising art director George Lois and other celebrities also worked toward Carter's release. With a network of friends and volunteers also advocating for him, Carter eventually won his release from U.S. District Judge H. Lee Sarokin, who wrote that Carter's prosecution had been "predicated upon an appeal to racism rather than reason, and concealment rather than disclosure." Born on May 6, 1937, into a family of seven children, Carter struggled with a hereditary speech impediment and was sent to a juvenile reform center at 12 after an assault. He escaped and joined the Army in 1954, experiencing racial segregation and learning to box while in West Germany. Carter then committed a series of muggings after returning home, spending four years in various state prisons. He began his pro boxing career in 1961 after his release, winning 20 of his first 24 fights mostly by stoppage. Carter was fairly short for a middleweight at 5-foot-8, but he was aggressive and threw a lot of punches. His shaved head and menacing glower gave him an imposing ring presence, but also contributed to a menacing aura outside the ring. He was quoted as joking about killing police officers in a 1964 story in the Saturday Evening Post, which was later cited by Carter as a cause of his troubles with police. Carter boxed regularly on television at Madison Square Garden and overseas in London, Paris and Johannesburg. Although his career appeared to be on a downswing before he was implicated in the murders, Carter was hoping for a second middleweight title shot. Carter and Artis were questioned after being spotted in the area of the murders in Carter's white car, which vaguely matched witnesses' descriptions. Both cited alibis and were released, but were arrested months later. A case relying largely on the testimony of thieves Alfred Bello and Arthur Bradley resulted in a conviction in June 1967. Carter defied his prison guards from the first day of his incarceration, spending time in solitary confinement because of it. "When I walked into prison, I refused to wear their stripes," Carter said. "I refused to eat their food. I refused to work their jobs, and I would have refused to breathe the prison's air if I could have done so." Carter eventually wrote and spoke eloquently about his plight, publishing his autobiography, "The Sixteenth Round," in 1974. Benefit concerts were held for his legal defense. After his release, Carter moved to Toronto, where he served as the executive director of the Association in Defence of the Wrongly Convicted from 1993 to 2005. He received two honorary doctorates for his work. Carter's papers will be sent to the Rubin Carter/John Artiz Innocence International Project at Tufts University outside Boston, Kidrin said. Director Norman Jewison made Carter's story into a well-reviewed biographical film, with Washington working closely alongside Carter to capture the boxer's transformation and redemption. Washington won a Golden Globe for the role. "He's all love," Washington said while onstage with Carter at the Golden Globes ceremony in 2000. "He lost about 7,300 days of his life, and he's love. He's all love." On Sunday, when told of Carter's death, Washington said in a statement: "God bless Rubin Carter and his tireless fight to ensure justice for all." The makers of "The Hurricane," however, were widely criticized for factual inaccuracies and glossing over other parts of Carter's story, including his criminal past and a reputation for a violent temper. Giardello sued the film's producers for its depiction of a racist fix in his victory over Carter, who acknowledged Giardello deserved the win. Carter's weight and activity dwindled during his final months, but he still advocated for prisoners he believed to be wrongfully convicted. Carter wrote an opinion essay for the New York Daily News in February, arguing vehemently for the release of David McCallum, convicted of a kidnapping and murder in 1985. Kidrin said Carter would be cremated, with some of the ashes given to his family. Two sisters are among Carter's survivors, though Kidrin said Carter was alienated from many relatives. Kidrin planned to sprinkle Carter's remains in the ocean off Cape Cod, where they spent the last three summers together. Artis planned to bring some of the ashes to a horse farm in Kentucky the boxer loved. Kidrin spoke with Carter on Wednesday. "He said, 'You know, look, death's coming. I'm ready for it. But it's really going to have to take me because I'm positive to the end.'" AP Sports Writer Rick Freeman and AP Drama Writer Mark Kennedy contributed to this report in New York.